On the picture is my most new 93mm Silver Alox Farmer. What I mean by most new is that it got the emblem with some important design changes. 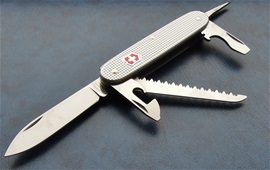 On the Pioneer Range or the sturdy Victorinox SAKs from 1957 until today you will find many design changes. You will also find an evolution on most parts in them. The Emblem used on the anodized aluminum scales with color got some important factors. I will explain one today. The emblem used from 1957 until today have some variations and many design differences that is not by accident or just production variations. If you look on the old Alox Cross emblem you can see that some of them got a more precise color around it. Some actually brings out the cross so it gives that 3D look. This is sometimes related to the new tang stamps after 1974. You will find it from time to time. 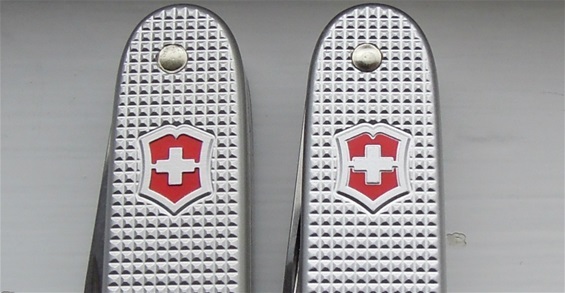 There are also some changes to the aluminum handles with the cut and design in history. If you look on the inner section of them there are some changes too. So on the picture you can see two modern emblems with cross and shield. The right one is very different if you look close. The cross comes out in a way and the lines around it tell a story as well. The coloring is made in a way that you get lines around the cross and towards the shield. That is a design factor that you can find and also on the old cross emblem like I have explained in history. This is not a factor that is by accident. It is a significant detail that one should be aware of and to remember. One may wonder and imagine why? There are probably several reasons for why it is so. One is the looks and another is the continuation of the quality development. Another can be production methods and evolution. Next I would believe it is about the protection of the Brand and products. The knife to the left above is a Pioneer Rancher compared to my most new Farmer. The silver Alox 93mm category share the same emblem evolution as long as it is silver Alox. The other Farmer knives I have are in the old Red Alox Cross configuration or other colors. 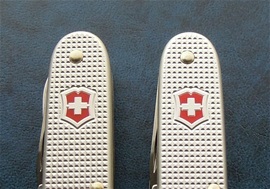 Many times in history with Victorinox it seems that emblem changes are related to changes in the tangs stamps. My New Farmer got the new tang stamp that is the ones used for only a few years now. At first it had a big V and now as you see a small v in victorinox. The Farmer is a tool that is considered super constructed. The 93mm Sturdy line of knives from 1957 pretty much can be considered timeless. It is probably one of the best designs and constructions in the entire world. The knife blade is 2,75mm thick. On the picture to the right you can see the Pioneer X and the Farmer. The left one is the X and it got the same emblem. Maybe the Farmer is even better detailed. 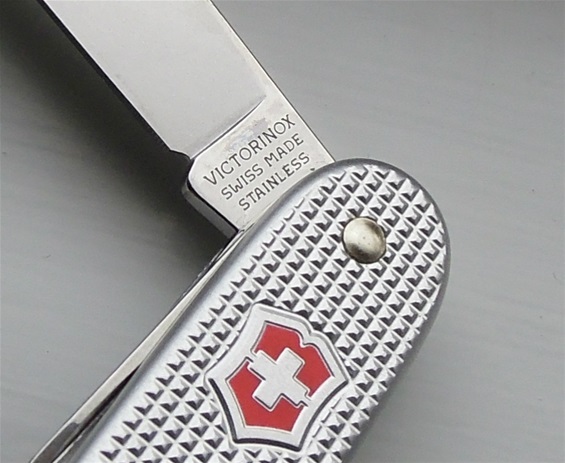 It tells me and it is the evidence in my research that this is a deliberate change in the Victorinox emblem for the Silver Alox. It is used for the 93mm Silver Alox category. Once again the emblem change is very close to the tang stamp change. This emblem will or may be used for other categories that said. The silver Alox is the main category. Please take the time to check around Sakhome.com and read about the SAKs and philosophies. The Farmer is easy to distinguish by the design, emblem, tang stamp and functions. Just imagine this knife in a survival situation! The wood saw relieves the blade from the hardest tasks. The awl will preserve the tip of the knife blade when you need to drill. The can opener will cut open a can of food + more.